JustGiving is the world's leading social giving company, enabling over 21 million people to raise £1.5 billion for over 12,000 charities since launching in 2001. Through online and mobile, JustGiving brings the best that technology has to offer to charities worldwide, with more charities recommending JustGiving than any other online fundraising platform. 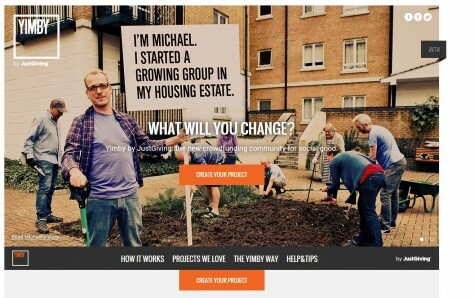 The latest chapter in JustGiving’s mission to revolutionise giving, Yimby.com supports a new wave of social activism – the local community guerrillas – by enabling ordinary individuals to raise the funds to run philanthropic projects for the benefit of their community. If you have a charitable idea – and this could be anything from renovating a local community centre or setting up a mentoring scheme for disadvantaged kids –Yimby.com is here to help. Through the power of crowdfunding, anyone can take positive action and generate support to make change happen. We developed creative research to highlight the rise of the YIMBY in Britain, generating a positive news story, which was covered, along with a corporate launch story, on Tech Crunch, in Metro and across other tech, third sector and social enterprise press. As a result of the campaign’s success, Yimby.com has already received hundreds of project applications with many more anticipated.